A fragrant mist to freshen up any room, linen closet, clothing, and yourself! 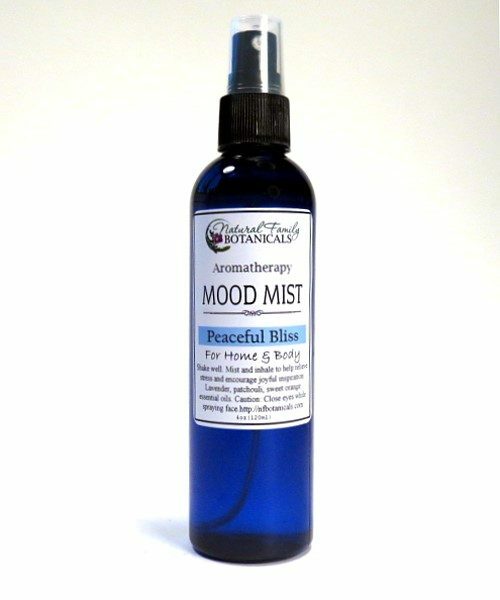 Aromatherapy Mood Mist is a refreshing air deodorizer to enhance your mood and create a pleasant scent in your home. 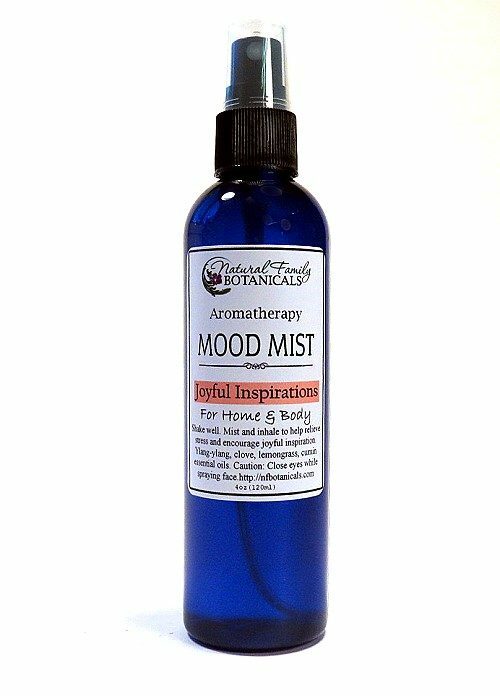 Spritz Aromatherapy Mood Mist in all the rooms of your home for an instant freshening of the air. Spritz it in closets and linen cabinets to remove stale odors and add a clean scent to clothing and linens. Keep one in your bathroom to keep the air tolerable when necessary! We keep one in our car for times when we need to snap out of drowsiness and be refreshed. Another use is for a light body perfume. 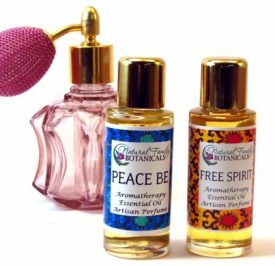 One of our customers uses Aromatherapy Mood Mist for a body perfume that she can safely wear in the office she works at without being overly scented so it doesn’t bother her co-workers. A versatile spritzer with many uses. 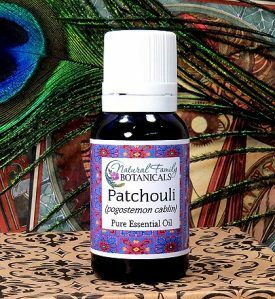 Contains quality essential oils and is safe for you, your family, and the environment. 4 oz recyclable spray top bottle. All mists are made using a base of distilled water and pure essential oils. Peaceful Bliss – Create a peaceful, calm environment with a pleasant aromatherapy blend of lavender, patchouli, and sweet orange essential oils. 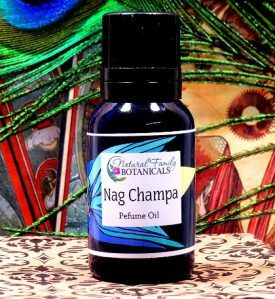 Joyful Inspirations – Energize and feel joyful with our exhilarating aromatherapy blend of lemongrass, clove, cumin, ylang-ylang essential oils. Forest Fresh – Soothing and refreshing, like a walk in the forest. A naturally calming and air cleansing blend of Virginia cedarwood, Siberian fir, Canadian Spruce, and pine. I LOVE this spray! Bought it at OCF and am so glad that you guys were there! I generally use it before bed to just take a minute to breathe and relax. In September I learned that I was pregnant and when I couldn’t stand the smell of literally anything else, this remained a soothing favorite. Now that I’m out of the first trimester I’m still loving it so much that I’ve asked my husband to please buy me several more bottles for Christmas this year! 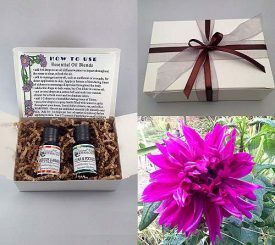 I have tried to recreate the scent blend with my essential oils so that I could run it through my diffusers, but have had no luck. I’d be interested if you made an EO diffuser blend, or would consider sharing (or selling) an oil blend ‘recipe’ for diffusing. I purchased this item at Oregon Country Fair a few weeks ago. This is the most wonderful blend (I purchased “Peaceful Bliss”). I work in a large office building and everyone who has smelled this on me has had a positive reaction. I probably spray myself 8-12 times a day and have only used 1/3 of the bottle so far. I will be purchasing this again!